Sorry, but that's not real cold. Once when I was in the US it dropped to -28C - that's real cold. It has barely been below 0 here. That's got to be a sunrise in Hawaii no? I like panoramic views. It used to be possible to buy dedicated panoramic cameras in the 1960s - one was called the Widelux. I think these days one can take two views side by side and stitch them together in a graphics programme. I really should try that sometime with a suitable subject. Haha SoN... the views from the edge of Crime Lake can be truly stunning at times. I don't do enough panoramic shots - you're quite right, they can produce superb results under the correct conditions. 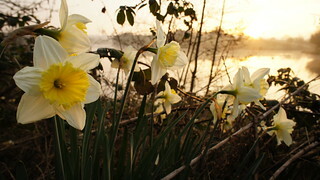 Here's a spring scene from practically the same spot. Is that car on the wrong side of the road or was it taken abroad? Ahh, I see what you mean. 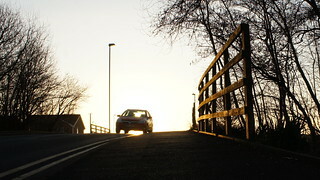 The photograph was taken on Cutler Hill Road, looking towards the bridge over the M60 and Daisy Nook. I'm stood on the pavement and the double yellow lines are by the kerb. Ahh yes I see – an optical delusion. Another raid on my dodgy photo archive reveals two taken when strolling along the Fairbottom Branch canal in the 1960s which may be of interest. Both were taken somewhere between Sammy’s Basin and Bardsley. 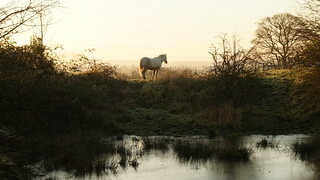 The first is a view from the towpath of some contented-looking horses on a pleasant day. 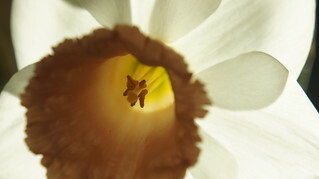 The colour is a bit iffy as I took it on a cheap camera with Perutz film stock. 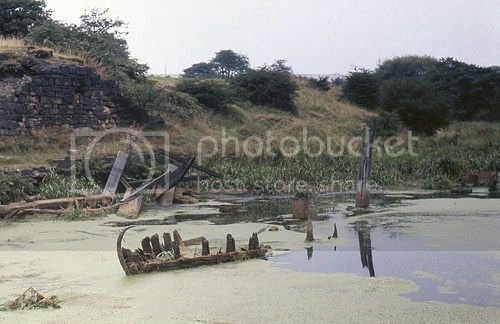 I don’t know if this wreck is the remains of an original working barge or of a pleasure boat that once plied its trade on the canal around 1900. I took this photo in 1968 when the water level was exceptionally low. To the left is a walled bank indicating the loading stage for coal once brought by tramway from the local colliery. Great shots! 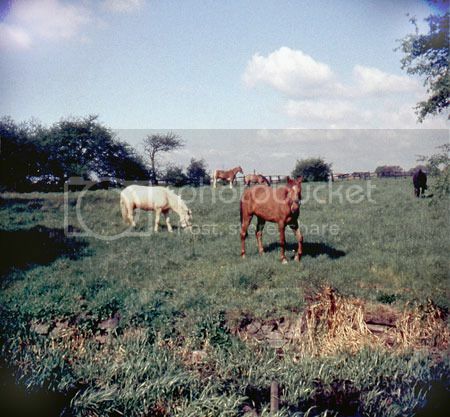 I suspect the trees on the far right of picture 2 are the same trees to the left of the horses in picture 1. 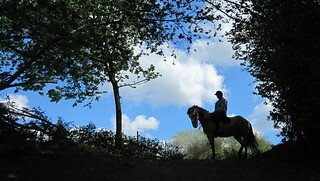 This is a shot of my daughter and her horse just further along Fairbottom - I'm lower down on the path that leads to the Medlock. You have a good eye for a photo opportunity Mark. When I look at your picture I'm strangely reminded of the Lone Ranger - can't think why.